Distraught with the complacency of the German Evangelical Church, Bonhoeffer became a founding member of the Confessing Church, which opposed the country’s growing anti-semitism. Intrigued by Gandhi’s adherence to non-violence, the pacifist Bonhoeffer struggled with a response. Opposition grew against his Confessing Church, resulting in it being declared illegal. Bonhoeffer was eventually forbidden to speak publicly, or to publish his writing. Bonhoeffer joined the Abwehr, working in military intelligence. With a Nazi plan to use German Jews as spies in America, Bonhoeffer was able to fund Jews exit from the country under “Operation 7,” with no orders other than to escape! In April, 1943, he, his brother-in-law, and others were then arrested. 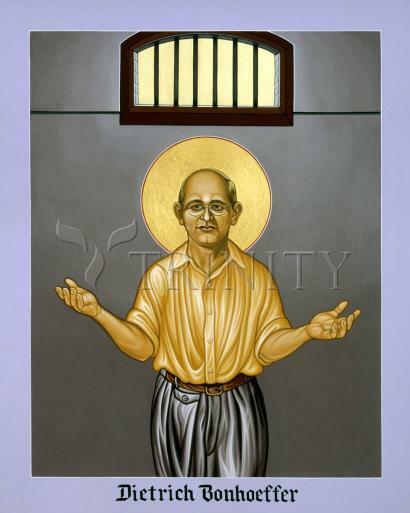 Many of his letters from prison show his growth in faith, yet hope for release. He was never released. The attempted assassination of Hitler July 20, 1944 was tied to Bonhoeffer and others. He was moved between several camps, and finally, at Flossenburg camp, within a few days of liberation by Allied forces, he was stripped and hanged, April 9, 1945. As he did, may you walk in faith, and find actions that are appropriate to your faith. Dietrich Bonhoeffer -- along with his twin sister, Sabine -- was born on February 4, 1906, in Breslau, Germany. Later a student in Tubingen, Berlin, and at Union Theological Seminary in New York -- as well as a participant in the European ecumenical movement-- Bonhoeffer became known as one of the few figures of the 1930s with a comprehensive grasp of both German and English language theology. His works resonate with a prescience, subtlety, and maturity that continually belies the youth of their author. He wrote his dissertation, Sanctorum Communio, at the end of three years at the University of Berlin (1924-1927) and was awarded his doctorate with honors. Act and Being, his Habilitationsschrift, or qualifying thesis allowing him to teach at the University of Berlin, was accepted in July 1930. The following year, 1930-1931, Bonhoeffer spent a postgraduate year at Union Theological Seminary in New York. He assumed his post as a lecturer in theology at the University of Berlin in August 1931. In the winter semester 1931-1932 Bonhoeffer presented the lectures that were published as Creation and Fall. His final lecture courses at Berlin -- published as Christ the Center along with a seminar on the philosopher G. W. F. Hegel, were taught in the summer of 1933. His authorization to teach on the faculty of the University of Berlin was finally withdrawn on August 5, 1936. Bonhoeffer served as a curate for a German congregation in Barcelona during 1929-1930. Following his ordination at St. Matthias Church, Berlin, in November 1931, he was to help organize the Pastors' Emergency League in September 1933, prior to assuming the pastorate of the German Evangelical Church, Sydenham, and the Reformed Church of St. Paul in London. During his sojourn in England, Bonhoeffer became a close friend and confidant of the influential Anglican Bishop, George Bell. After the Confessing Church was organized in May 1934 at Barmen, Germany, Bonhoeffer returned from England in the spring of 1935 to assume leadership of the Confessing Church's seminary at Zingst by the Baltic Sea -- a school relocated later that year to Finkenwalde in Pomerania. Out of the experiences at Finkenwalde emerged his two well-known books, The Cost of Discipleship and Life Together, as well as his lesser known writings on pastoral ministry such as Spiritual Care. His work to prepare pastors in the Confessing Church continued all the way to 1939. Bonhoeffer's early travel to Rome, his curacy in Barcelona, and his post-doctoral year in New York (including regular work at Abyssinian Baptist Church in Harlem, as well as travel to Cuba and Mexico), opened Bonhoeffer to the ecumenical church. In 1931 he was appointed youth secretary of the World Alliance for Promoting International Friendship through the Churches, and in 1934 he became a member of the Universal Christian Council for Life and Work. At conferences throughout Europe he vigorously represented the cause of the Confessing Church and challenged the ecumenical movement about its theological foundations and its responsibility for peace. Bonhoeffer's theologically rooted opposition to National Socialism first made him a leader, along with Martin Niemueller and Karl Barth, in the Confessing Church (bekennende Kirche), and an advocate on behalf of the Jews. Indeed, his efforts to help a group of Jews escape to Switzerland were what first led to his arrest and imprisonment in the spring of 1943. His leadership in the anti-Nazi Confessing Church and his participation in the Abwehr resistance circle (beginning in February 1938) make his works a unique source for understanding the interaction of religion, politics, and culture among those few Christians who actively opposed National Socialism, as is particularly evident in his drafts for a posthumously published Ethics. His thought provides not only an example of intellectual preparation for the reconstruction of German society after the war but also a rare insight into the vanishing social and academic world that had preceded it. Bonhoeffer was also a spiritual writer, a musician, and an author of fiction and poetry. The integrity of his Christian faith and life, and the international appeal of his writings, have led to a broad consensus that he is the one theologian of his time to lead future generations of Christians into the new millennium. He was hanged in the concentration camp at Flossenbürg on April 9, 1945, one of four members of his immediate family to die at the hands of the Nazi regime for their participation in the small Protestant resistance movement. The letters he wrote during these final two years of his life were posthumously published by his student and friend, Eberhard Bethge, as Letters and Papers from Prison. His correspondence with his fiancé, Maria von Wedermeyer, has been published as Love Letters from Cell92.